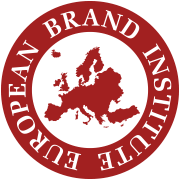 The GLOBAL TOP 100 BRAND CORPORATIONS RANKING by European Brand Institute – Europe’s independent brand & patent valuation experts, examined more than 3.000 brand corporations and their brands in 16 industries, according to the latest ISO valuation standards. Apple remains world’s leading brand corporation with a brand value of EUR 148,531 bn (+8%), followed by Google representing EUR 91,850 bn (+25%) and Microsoft with a brand value of EUR 75,572 bn (+13%). Amazon increasing its brand value by +54%, climbing to global rank 7. Asian No.1 China Mobile EUR 52,946 bn (+9%) holds global rank No.9. French No.1 LVMH remains Europe’s most valuable brand corporation, representing brand values of EUR 43,510 bn (+9% / global rank 14), followed by Belgian AB Inbev showing EUR 39,468 bn (+10% / global rank 17) and Swiss No.1 Nestlé representing EUR 37,957 bn (+11% / global rank 20). 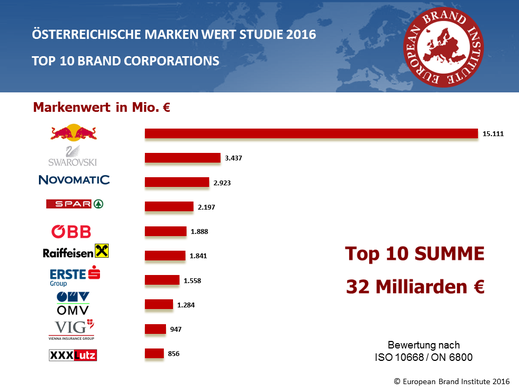 German No.1 Volkswagen Group EUR 26,662 bn holds global rank 28, Austrian’s Red Bull EUR 15, 111 bn holds global rank 70. Average growth of TOP 100 shows +13%, TOP10 USA rise by +17%, TOP10 China grow by +22% and Europe’s TOP 10 grow by +13% . Alibaba shows the highest growth (+77%), followed by Facebook gaining +57% and ex-aequo Starbucks and Amazon by +54%. Europe’s growth leaders are Robert Bosch and BT Group increasing their brand values by +28%. US brand corporations are leading with 49 (+2) out of the TOP 100 brand corporations. Europe represents 35 (0) with Germans leading, whilst Asia is represented with 16 (-2) brand corporations. Automotive – Volkswagen Group (Germany), Business Services – SAP (Germany), Consumer Goods – AB Inbev (Belgium), Durables – Bosch (Germany), Financial Services – HSBC (U.K.), Industry – BASF (Germany), Luxury – LVMH (France), Media & Entertainment – Bertelsmann (Germany), Pharma, Health & Biotech – Novartis (Switzerland), Retail – Inditex (Spain), Telecommunications – Vodafone (U.K.), Utilities – Shell (U.K.). Am 6. Juli 2016 präsentierten Dr. Gerhard Hrebicek, Vorstand European Brand Institute, Dr. Gerald Ganzger, Partner LGP, Dr. Monika Poekh-Racek, Vorstandsvorsitzende Admiral Casinos & Entertainment AG und Werner Kuhn, Director Business Development, Marketing & Sales, SK Rapid Wien, die Ergebnisse der 13. Österreichischen Markenwert Studie: 1. Red Bull mit EUR 15,11 Mrd. unangefochten an der Spitze, Wachstumssieger Swarovski glitzert mit EUR 3,44 Mrd. auf Platz 2, TOP3: Novomatic Group mit EUR 2,92 Mrd. Markenwert ausgebaut, ÖBB rücken auf Platz 5 vor.